Honda Recalls 126,000 Motorcycles | Hupy and Abraham, S.C.
Honda has issued two recalls of its popular model GL-1800 touring motorcycle due to problems with the rear brakes. The rear brake discs drag causing the pad to overheat. That in turn can cause brake failure or fire. Over two dozen complaints about rear brake problems caused Honda to initiate a recall back in December, 2011. Apparently, the same problem is continuing and after numerous complaints, Honda issued a second recall. According to reports, 126,000 GL-1800 model motorcycles are involved. 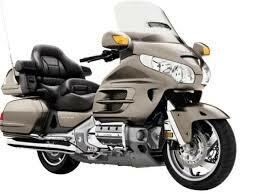 Honda is advising owners of this model with bikes manufactured in 2001-2010 and also model year 2012 to take their bikes to authorized dealers when they are notified by mail that repairs and parts are available.